A critical health and safety requirement for any business is that they have first aid kits. This obligation is particularly important for catering and hospitality establishments, which are categorised as a high-risk industry, given the potential exposure of staff working with dangerous appliances, equipment and hot liquids alongside the potential for high footfall in customer areas. When an emergency occurs, it can be hard for people to think straight and in all the chaos, forget all together what needs to be done. For this reason, it’s more important than ever to ensure a first aid kit is located somewhere quickly accessible and known to all. Spectra from our supplier Reliance is a range of ABS plastic wall panels that allow users to easily access their first aid kits. Each panel is placed directly onto a clear wall and holds useful product information and first aid guidance, a primary first aid kit, designed for the intended location, and supplementary products to enhance the practicality of the panel. Being made from high quality ABS plastic means that not only do the panels look great, but they are also durable and strong enough to last in tough environments. It’s also easy to match the panels required with the level of risk identified in any workplace. Each panel will interlock with others, using plastic joining pieces, to provide a comprehensive and complimentary first aid solution, tailored to any organisations unique requirements. The carefully thought out design of Spectra makes products easily identifiable in an emergency and easy to access when you need them. Products can either be taken directly from each panel, or the appropriate kit can be removed and taken to the casualty. Workplace First Aid System – Designed to fit the requirements of BS8599-1, the kit contains bandages, plasters, dressings and wipes. Catering First Aid System – Designed specifically for use in busy kitchens, containing 100 per cent blue products. Eye Wash First Aid System – Provides fast and effective treatment for minor eye injuries. Biohazard Clean Up System – Body Fluid and Sharps Clean-up packs contain everything required for containment and disposal in individual boxed applications. Burns First Aid System – For the treatment of minor burns; includes various sized dressings to relieve pain, cool, and comfort. AED System – Everything required for the effective treatment of adults or children in a CPR emergency. 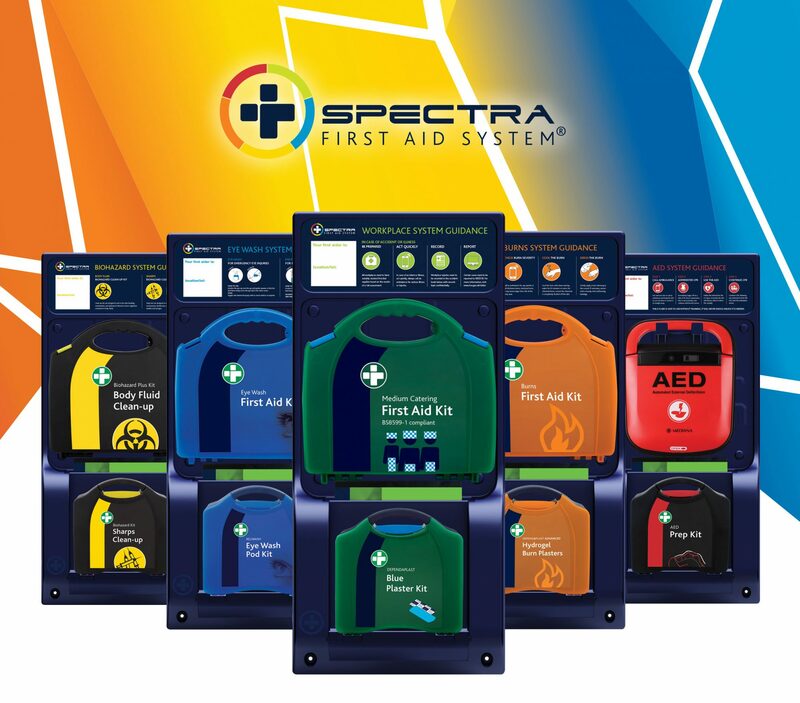 Spectra is available now and ready to change the way you think about First Aid in the workplace. For more information on the Spectra range from Reliance, please contact Bunzl Catering Supplies today. Automated External Defibrillators (AED) are essential life-saving devices when somebody experiences a cardiac arrest.